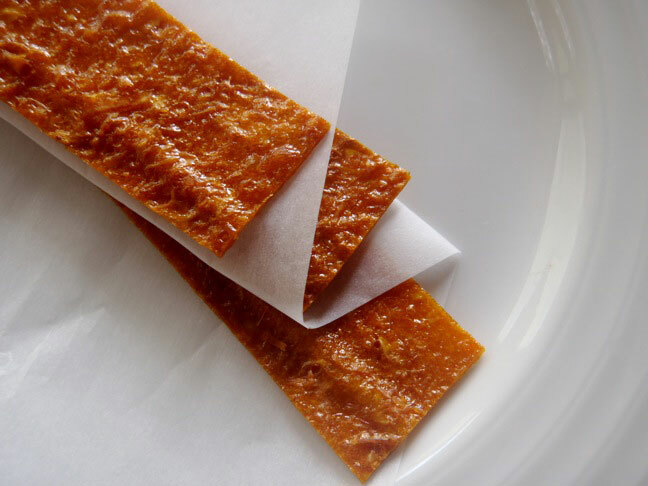 Yesterday I got an email from a friend and her 5 year old daughter requesting that I create a recipe for tangerine fruit leather. I've only made fruit leather a couple of times and think it's healthy, easy, and super fun for kids! Coincidentally, I'd just purchased a huge bag of tangerines. I also had a few ripe mangoes and added them to create a slightly thicker mixture of fruit and a great flavor combination, to boot! These are great as a quick snack, as an addition to a lunch box, or even chopped up in granola! Hopefully, I fulfilled my friend's request! Preheat the oven to 200 degrees and cover a rimmed baking sheet with parchment paper. 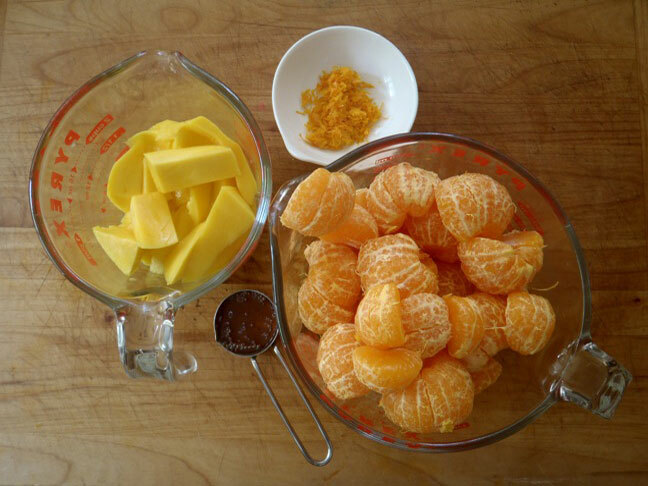 Add the tangerines to a blender and puree until they've reduced in size by about half. Then add the mango, honey, and zest. Puree everything until the mixture is as smooth as possible. (It won't be 100% smooth.) Pour the fruit mixture onto the parchment covered baking sheet as evenly as possible. Bake in the preheated oven for approximately 4 hours, until the fruit leather is dry but not dark. The color should still be a pretty, somewhat bright, orange. Let the leather sit for at least 8 hours at room temperature so that it becomes soft. Then cut it into strips with scissors or a knife. Voila! I like the sweet and sour flavor of this fruit leather. However, if you want less of the sour and more of the sweet, omit the zest and add an extra tablespoon of honey.